The KANO Pixel Kit is a programmable 8 x 16 grid of RGB pixels (and more.) We backed the Kickstarter campaign and it has arrived. I tested the Pixel Kit with my 9-year-old son as he shares my love of pretty lights. Slightly annoyingly our kit isn't the retail kit, but it does pretty much the same thing so our review should still be useful. We should note that the KANO App is in beta. We mention some things that we don't think are working as well as they could because our reviews are always honest (and often things we mention get addressed in future releases.) But the kit has only just reached backers and it's early days. Basically, we love the kit, but we want it to be even better! The Pixel Kit is a programmable RGB LED display with a rechargeable battery. It comes as a kit to build with buttons and a clear case. The kit is designed for kids aged 6+. That's not to say that only little kids will enjoy it, but it's great that it's acknowledged that many kids that age are absolutely ready for a product like this. 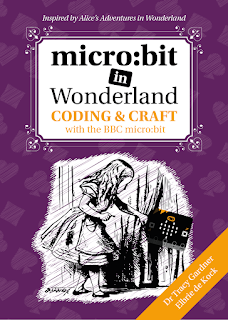 Older kids will be able to create more advanced projects. The box for the Pixel Kit is gorgeous. A lovely red sturdy card box with a magnetic clasp. It has a foam insert to keep everything in place during travel. Very nice. We do appreciate good storage, it makes it so much easier to keep everything together and kids are more likely to put things away. In this case, everything except the USB cable ends up built into the Pixel Kit so you don't have much to store. I don't think this kit will spend much time in a box anyway. Our Kickstarter kit includes a Motion sensor which isn't included in the retail kit but will be available as an add-on. You get a nicely illustrated colour manual which takes kids through the assembly process. Honestly, we'd have preferred digital content in the app for this, but I know some families will appreciate not having to find content online to get started. The assembly is fairly straightforward. We'd recommend putting the filter in from the start as the LEDs are very bright. We learned this the hard way and I had to work out how to take the case apart again to put it in. The only bit of the assembly my son struggled with was threading the lanyard through as it's quite a precise thing to do. Once the kit is assembled you can run the light show and game demos which are really fun. These are great for getting to know the kit and understanding the kind of apps that can be created for the Pixel Kit. There doesn't seem to be a tablet app which is a shame for such a portable device. However, it works brilliantly on a touchscreen Windows 10 laptop. You need to connect the Pixel Kit to a computer the first time you use it and configure it for your Wifi network. I put it on our guest network and now it can be programmed wirelessly. Neat. We did find that we had to use the cable and set up the wireless network again every time we turned the Pixel Kit off which was a bit annoying. Not sure what's going on there. There's lots of tutorial content to take you through all the features and get started. My 9-year-old is a tinkerer so he lasted about 30 seconds with this saying 'okay I get it, now can I create my own thing?' I think other children will appreciate this content more! I tried going through it myself and did find that its linear path approach is quite constraining and I think there's a risk that kids could just click without really taking in what they are doing. Useful for complete beginners maybe. What my son needed were examples to look at or an overview of the concepts. He just wanted to see how you do things in Pixel Kit. He wanted to be able to move a sprite around. He had to keep flipping between the project he was working on and a tutorial that gradually revealed how to do it. It was also a bit confusing because one tutorial uses an Animation for a character so my son started down that path. Another shows a useful 'move left by 1 pixels' block which is only there if you make a Rectangle rather than an Animation. That's an expensive mistake to fix when you've got some code written already. 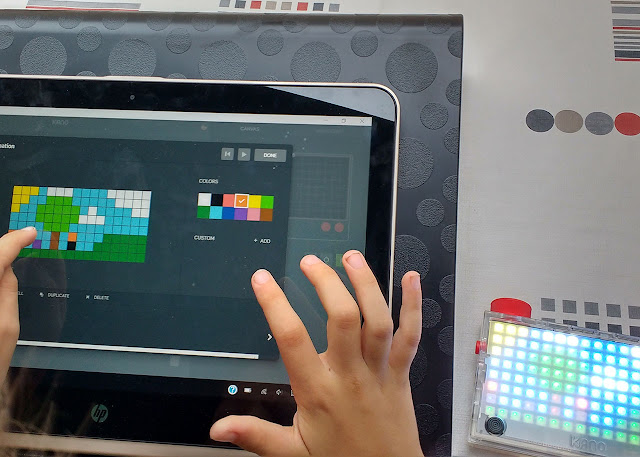 The coding app uses familiar brightly coloured drag and drop blocks. There are some differences with other block-based languages that my kids use regularly, you can't drag blocks to the palette to delete them which caught us out lots of times. We couldn't delete an animation because of a block we couldn't see. My son got really fed up with having to drag an empty block every time he needed to enter a number or string, it makes it more work than just typing in a text language. Doing simple things like scrolling text and changing the colour of pixels is easy. But there's a steep learning curve for harder things like writing a game. 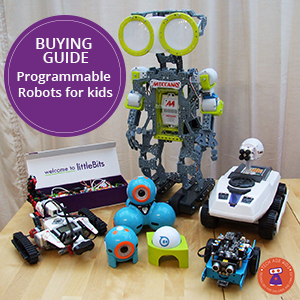 There's plenty of scope for older kids and beginners to create complex projects. We were confused by saving. It's a desktop app but when you save it offers a share link. Is it being saved online? It turns out that it is even if you don't click share. The share link that you are offered works even if you don't do anything to share a project. My son didn't think he'd shared but I could see his project online. It's really important that apps for children explain things like this clearly. Kids should know when they are making their work public. They could easily include personal information without realising they are sharing their work with the world. We also couldn't find a way to edit an existing project. This means that all intermediate works in progress get shared and it's also really hard for kids to manage their projects as they end up with tons of copies. My kids tend to work on a project over several sessions and missing the concept of a project they can edit and improve. 'Remix' doesn't feel like the right concept for an unfinished project. I've seen this approach used as a workaround when you don't have an account, but the KANO app forces you to create an account. My kids like to choose when they want to share a project for public viewing and commenting, not have to share it because they want to save their work because it's time for bed. The app does save the most recent project but you lose this if you navigate around and look at a tutorial. We found the process of regularly saving a project as you make progress really painful. This is important for longer projects. There are lots of shared projects with an increasing sequence of numbers on the end, I'm sure in most cases kids only want to share their most recent version. Hopefully we'll see improvements in future. The Pixel Kit has a joystick input and two buttons. We were a bit confused by the buttons. If you hold the Pixel Kit in the way shown in the diagrams and in the app then A is on the right and B is on the left. Last year we created a giant pixel grid which my son loved creating piskelapp animations to run on. Using Pixel Kit with animation is like this but with instant gratification. Kids can create animations in the KANO app and they instantly and wirelessly sync to the Pixel Kit. 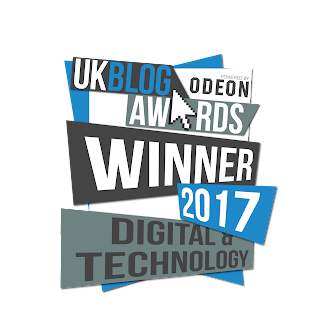 This worked very well with my son's HP Pavilion x360 laptop in touchscreen mode. If this was all the kit could do it would be a winner for my 9 year old. It removes all the friction and adult help needed to his animations onto a grid of lights. And it's programmable in a way that he understands. Having power, inputs and sensors in the same package as the pixel display is fantastic. Really practical and easy to use. There are lovely details like the lanyard, a tripod mount point and wall mount holes on the back. One problem that my son found was that the power button is on the side and he managed to accidentally turn it off when holding the device, several times. He pointed this out to me and said "I would have put the power button on the top, not the side." 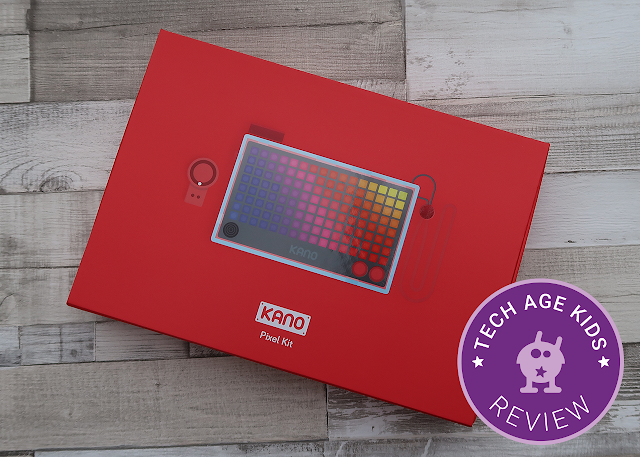 We found that we had to completely restart the KANO app to get reconnected after turning off the Pixel Kit. My kids also found the joystick quite tricky to use at first. They're starting to get the hang of it, but find it much easier to use the arrow keys on the keyboard. You can access data from web / cloud services such as the current weather and time and the location of the space station. That's pretty cool. There's also a sports feed. When we tried this the headlines included mentions of homophobic slurs, racism and a banned substance being transferred by kissing a girlfriend. We may just have got unlucky, but it's something to be aware of as the kit says it can be used unsupervised by young children. I don't have a problem discussing these topics with my kids, it was just a bit unexpected in this context and I would have appreciated a warning. There's also support for RSS feeds. This means that you can integrate external data which is very cool. I'm not sure it's possible to get tired of pretty lights :-) But this kit isn't just a pretty face. There's plenty of scope for creating cool games, apps and gadgets. There are more sensors coming along in the other kits and you can add three at once to the pixel kit. The Pixel Kit retails for $79.99 / £74.99. Yeah, that's a chunk of money. But there's a lot of tech in there and it's been designed to be usable by kids and there's educational content. Perceived value for money is very subjective and highly dependent on whether a family actually uses the device. The Pixel Kit does a lot to remove the things that often get in the way of regular use. There's a rechargeable battery, wireless programming and a protective case and lanyard. This makes it a great candidate for quick projects when someone has an idea. This kit was significantly delayed, the kit was supposed to arrive in time for last Christmas. (As we've mentioned before, never back a crowdfunded project as your child's main Christmas or birthday gift, it rarely ends well.) It's very unusual for a tech crowdfunded project to deliver on time so this is normal. There were production delays including a fire in a supplier's factory. There was communication and it was interesting to follow along. The Pixel Kit was a $99 plus shipping reward with the retail price expected to be $129.99. Now KANO has the Pixel Kit priced at $79.99. That's $20 cheaper than backers paid. There is an update which explains this. The retail kit has cheaper hardware and it doesn't include the motion sensor. When I opened our kit I noticed that the hardware seemed like overkill for the application. We'd built a big 16 x 16 pixel display last year using an ESP32 chip which has wifi capability which we used to upload animations. The new retail kit has an ESP32 chip in which we'd expect to be plenty good enough for the Pixel Kit. This is, of course, one of the potential pitfalls of backing a crowdfunded project. Look, I'll be honest with you. I'm a sucker for pretty lights. 128 pretty lights that I can program easily. I'm in. Oh, you wanted to know what the kids think? My son's a sucker for pretty lights too! 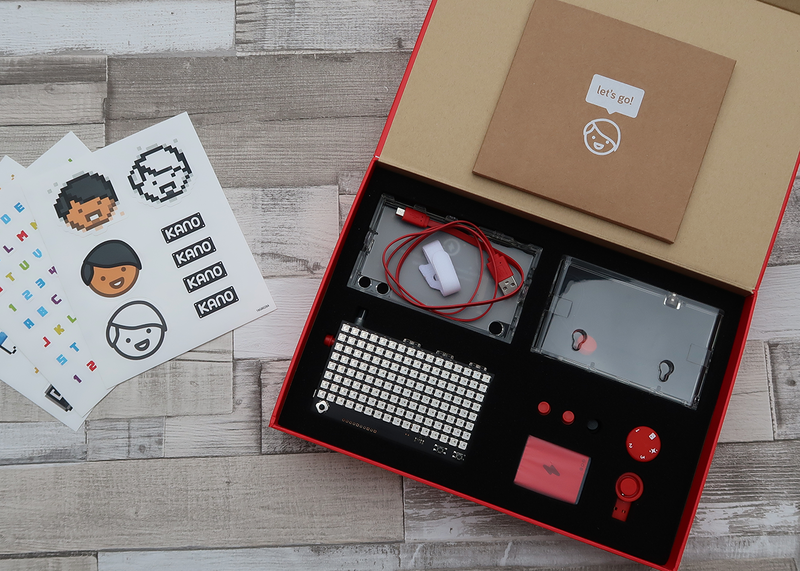 My kids absolutely loved the live two-way integration between Pixel Kit and laptop. It made it really fun to develop projects and really clear what was happening. 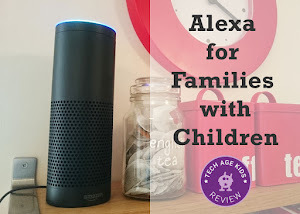 We're big fans of kid-created tech that can become part of everyday life rather than something that just goes back in a box and take up space. We did have some concerns around project saving and sharing which we'd like to see addressed. And some usability issues with the KANO app, but it's in Beta so we really not worried about that at this point. 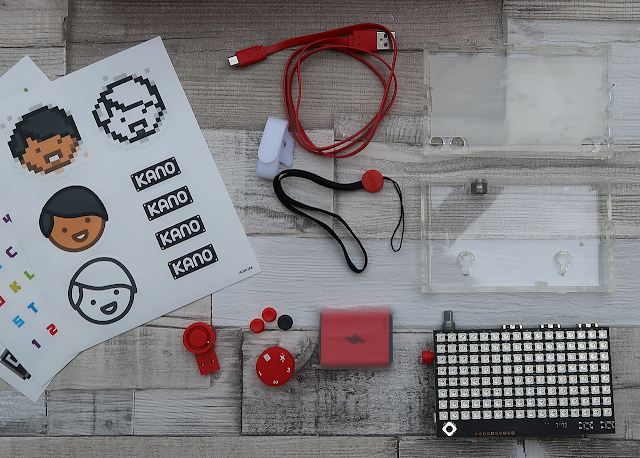 The Kano Pixel Kit is available from the online Kano Store US | UK.